The many benefits available to LO members could even help to save money for retirement. Group buying power can save you tens of thousands of dollars each year. Business owners are able to help one another through participation in Landscape Ontario. Extra copies available for Chapter and Sector groups. Welcome to 2018! I have very high hopes that this year is going to be a great one. To kick off the year, I am taking a page from Pam Halpert (fictional character on the TV show The Office) and I’m encouraging everyone to come up with some New Year’s resolutions. While you may want to resolve to eat your veggies, do more physical exercise, or take up a new hobby, here are five suggestions for your 2018 business resolutions. Investing in your staff improves employee retention and results in a better trained workforce for your company. Seminars contain valuable information for employees on a variety of topics including: practical skills, safety training, customer service and management skills. The special LO member pricing on these courses makes LO’s professional development series an affordable option for staff training. It also gives your employees something to do during the winter months (if you’re not overwhelmed by snow). Chapter meetings also contain valuable information. If you can’t attend a meeting, why not send your staff so they can relay the information back to you? Chapter’s invite guest speakers who share valuable information relevant to running your business, managing staff and also best practices that your employees can utilize. Dinner or lunch is usually included. See, there is such a thing as a free lunch! All members are probably aware of the great new vehicle and fuel savings offered through the Canadian Nursery Landscape Association (CNLA) Endorsed Supplier program. As a member of LO, you are automatically a member of CNLA, which uses the buying power of our profession across Canada to negotiate great deals on many of the services, supplies and equipment your business uses every day. Discount cards for Mark’s Work Wearhouse, great rates on hotels, vehicle rust proofing, staff training, new equipment and more, can save you tens of thousands of dollars each year. Who wouldn’t like a New Year’s resolution that involves saving money? 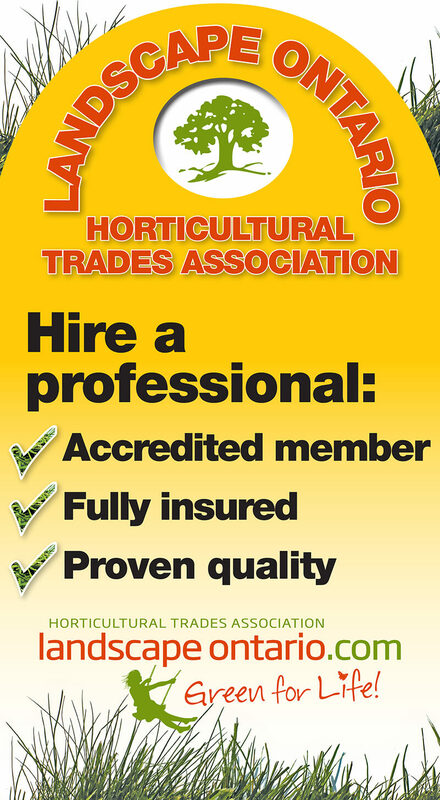 A full list of the member savings programs can be found at HortTrades.com or CNLA.ca. Many of the Endorsed Suppliers also exhibit at Congress each year where you can learn all about their offerings specific to your business. LO’s Professional Member decals are a great way to be seen in traffic. We are excited to offer members a new decal for their truck, vehicles and equipment that better explains the reasons why a home or property owner should hire a professional member of Landscape Ontario. These new decals are available for free to all members. Communication is always one of the keys to success. In a world that seems to get busier and faster, we rarely take the time to communicate our goals and objectives with others in our business. What are your plans for your business this year? Are you looking to take on bigger projects? Is your company growing and are staff expected to take on more responsibility? Communicating your plans for the year with your staff is important to set the tone for the upcoming season. Making sure staff have an idea of when things will be starting back up this spring or a list of tasks that must be completed over the winter are great ways to keep them engaged and feeling like a valued part of your team. Once the spring madness starts, daily or even weekly meetings all your team members will help everyone to work towards a common goal and help to avoid mistakes and frustration. Why not put up a resolution board for your team to keep track of company goals throughout the year? LO provides many end-of-season soirees that are a great way to celebrate another year of hard work, but November is a very long time away. Why not bring your staff to a more social chapter event this winter such as Ski and Spa Day or bowling? These events will definitely held to build camaraderie among your team. These daytime events don’t take away any family time and offer the chance to strengthen your work family. Your staff will enjoy them and they will feel like a truly valued member of your team even before the busy season starts. Make sure to stop by the LO booth at Congress to get your new and improved member truck decals. I look forward to seeing you there! Here’s to a fantastic 2018! Myscha Stafford can be reached at myscha@landscapeontario.com or 1-800-265-5656 ext.2333.